Mwila woman of Angola with her daughter. 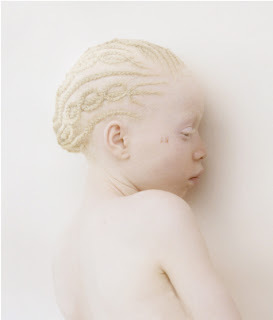 Albinos in Angola are subjected to the persecution and discrimination common in most parts of Africa. However, a mother’s love is the strongest power that saves the lives of these innocent children! Alice Walker, The Color Purple and Albinism? In the immensely acclaimed novel by Alice Walker, The Color Purple, almost an entire chapter is dedicated to explaining albinism in Africa. The African Olinka villagers are said to believe that “white people is black people’s children” and that Adam and Eve were naked in the Garden of Eden not because they had no clothes on, but because they were born with white skin, since the word ‘naked’ and ‘white’ are synomous in the Olinka language. The book goes on to say the Olinka people legend believed Adam was not the first man on earth but the first white man (albino) born to black parents that was allowed to live and not killed at birth. But as more ‘naked’ children were born, the Olinka chased then from the village rather than killing them and never gave it another thought until white missionaries came to their village. 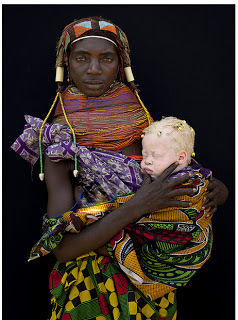 Kuna people have the highest incidence of albinism in the world. According to Kuna legend, the albino people are called “moon children” and are given the responsibility of shooting arrows at the full moon. Since the moon controls the tide, and Kuna people live on small atolls, they’ve interpreted the presence of albinos as a gift from the gods to protect them from rising tides. Did you wonder how albinos were treated during the time of Sundiata Keita, founder of the Mali empire? In the 13th century, it is believed that albinos were very much apart of society and the males were often made guards of the kingdom, believing they would instantly ward of ennemies by their ‘ghost-like’ appearances.